After listening to the news coverage today of all the snow that Amarillo, Texas was receiving, it reminded me of a not-so-cold video about Amarillo I saw a year ago. Back in 2005, members of the Royal Dragoon Guard serving in Al Faw, Iraq took some free time to film a spoof video to the song “Is this the way to Amarillo” before returning home from their 6 month tour. When the video was e-mailed to their friends back in London, the video demand ended up crashing the Ministry of Defenses server. No harm was done, and no one was punished for their actions. And now, it is my pleasure to bring you the best music video ever to come out of Iraq! SYDNEY, Jan 4 (Reuters Life!) – An Australian bank has apologized for issuing a credit card to a cat after its owner decided to test the bank’s identity security system. “I just couldn’t believe it. People need to be aware of this and banks need to have better security,” Campbell told local media on Thursday. 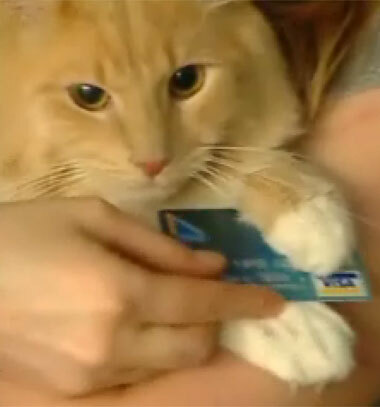 The bank said the cat’s card had been canceled. “We apologize as this should not have happened,” it said in a statement.